My 14-year-old daughter lost an upper front tooth in an accident two years ago. The tooth was re-implanted, but my dentist said it must be removed. What’s the best way to replace it until she’s old enough for a dental implant? As you correctly point out, a 14-year-old is too young to receive a dental implant — the state-of-the-art method for permanently replacing a single missing tooth. That’s because her jaw is still growing and an implant-supported tooth, which integrates with the jawbone, could end up being out of alignment as jaw growth continues. Your daughter’s progress will be monitored with the help of x-ray images to determine when the time is right (late teens at the earliest). Meanwhile, your daughter has at least two good options for temporary tooth replacement; one is removable (can be taken in and out of the mouth) and one is fixed (stays in the mouth all the time). Let’s take a close look at each of her choices. A removable partial denture (RPD) is a prosthetic (false) tooth set into an acrylic base material that is colored pink to look like gum tissue. There are various types but the RPD most commonly recommended for teens has a prosthetic tooth surrounded by hard, pink acrylic. It is sometimes held in place by metal clips that fit over the adjacent teeth. This appliance is also called a “flipper” because some people find that with practice they can flip it in and out with their tongue. You can eat with a flipper in place, but need to be somewhat careful. For example, biting into something hard like an apple could cause the prosthetic tooth to break off. Adults who need a tooth replaced often opt for dental bridgework. 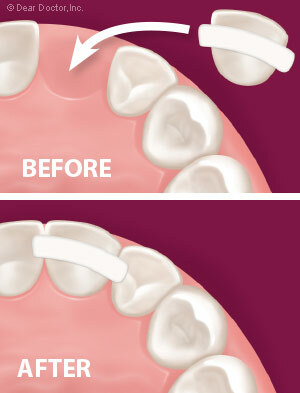 A traditional dental bridge requires capping the teeth on either side of the gap left by the missing tooth, and using those caps to support a false tooth in between. 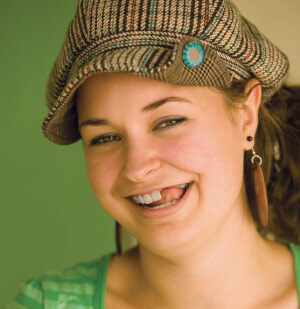 This is not an appropriate option for teens because capping teeth involves removing a good deal of their protective enamel and is therefore irreversible. Fortunately, an alternative technique has been developed that requires little — if any — altering of the adjacent teeth. It’s called a “bonded bridge” or sometimes a “Maryland bridge,” after the University of Maryland where it was invented. A bonded bridge for a single tooth looks like a false tooth with little wing-like projections on either side. These “wings” are bonded to the backs of the adjacent teeth, where they are hidden from view. Attaching the bridge this way means no support teeth have to be capped; but it also means that the bridge is less secure than a traditional bridge. However, with proper care, it can hold up until a youngster is ready to receive an implant. This temporary tooth replacement method costs more than a removable option, but it buys the most time, is the most comfortable, and looks the most natural. Bite. How the upper and lower teeth contact each other has a bearing on how well a bridge would hold up. There is a risk of breakage if she has a deep bite, meaning her top teeth cover a lot of her bottom teeth — bringing them into contact with the bonded wings. Also, if the teeth adjacent to the gap are on different planes (one is more forward than the other), this could cause the bridge to flex and break. Habits. A teeth-grinding habit could also break the bridge. The risk can sometimes be reduced with an occlusal (bite) guard often worn at night to alleviate grinding habits, or by fabricating the bridge to minimize contact with the opposite teeth. Likewise, if she plays sports, a custom-made mouthguard will be essential to protect your investment. Periodontal health. Replanting your daughter’s knocked-out tooth likely helped preserve the periodontal tissue (“peri” – around; “odont” – tooth) that held it in place. However, your dentist will ensure that the adjacent teeth are supported by healthy bone and gum tissue before subjecting them to the stress of a bridge. Hygiene. Maintaining good oral hygiene around bridgework is essential — and harder to do than with a removable appliance. She will need to brush twice each day and floss around the bridgework at least once a day. Biofilm (bacterial plaque) buildup can result in tooth decay and/or gum disease that could not only jeopardize the bridge, but also reduce the chances for successful implant treatment later. 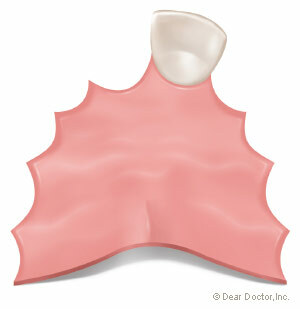 When it comes to deciding on the best temporary tooth replacement, there is no one-size-fits-all approach. Your dentist can help you determine which course of action best fits your daughter’s bite, her lifestyle, and your budget.